I had to leave it on overnight as something was running in the terminal. Thus, it counted that time as “uptime” while I was sleeping . An .iso was being created (a fork of Antergos) and the last command took several hours… As I executed the command before going to bed last night, I had to leave it up and running so it could complete the .iso build. If you are curious about the new .iso that is in progress, more information is here. Sorry . I didn’t quite understand where you were going with your comment earlier. @A-User ooohh! That’s is a neat trick! Thank you! Thanks! I’m glad you found it useful . I think this is one of the advantages of the dark themes. The colours stand out more while being softer to the eyes. 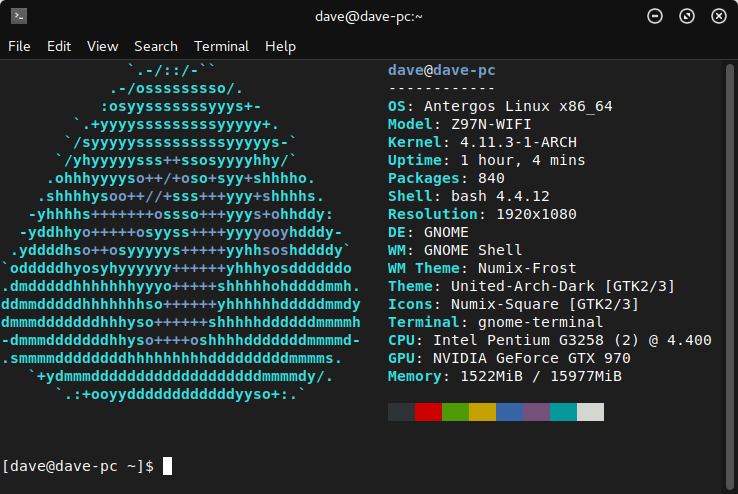 I prefer a light and airy theme myself, but even I prefer a dark terminal . @catsndogs You can use VLC player to create ascii art. VLC can view pic files and has an option to playback in ascii. Open VLC > open file > select your picture > press play (should see picture in the viewer) > pause > screenshot > Viola! Edit PS: “Screenfetch” is what I was using to retrieve my sys info in terminal (it’s in the repos, screenshot at the above link). Can I follow this same procedure to set the default image shown in the terminal when “neofetch” is run? @A-User If that question was for me, I’m not sure how to change your terminal picture. I was using it to make wallpapers. Thank you so much, @blinky . I didn’t intend to make you go to all of the trouble of finding out how to for me, I was just wondering if you already knew how. But thank you all the same! I reallly appreciate the links you posted . 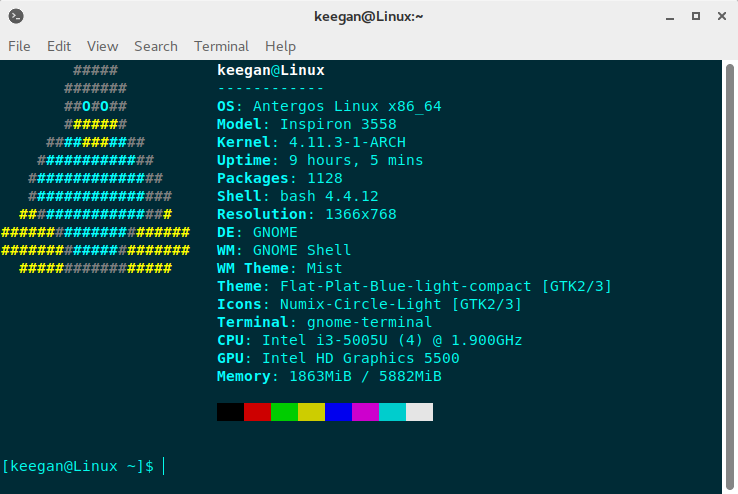 This is my new terminal (for now at least). If anyone wishes to change the logo that appears, simply run neofetch --ascii_distro *name-of-distro*. 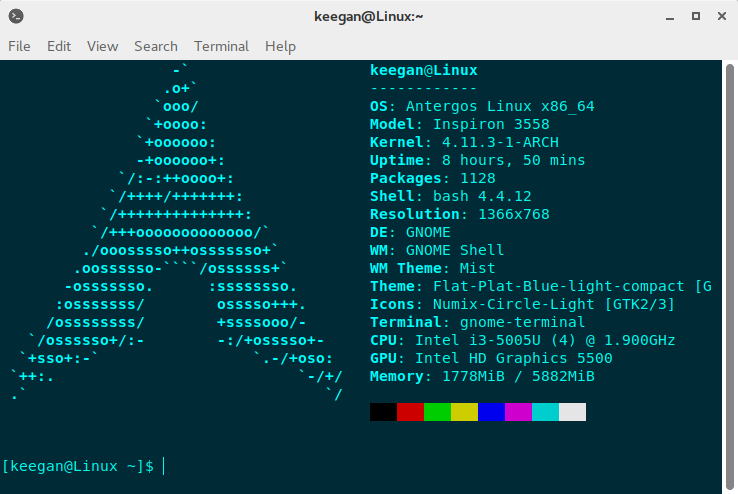 Here’s an example: neofetch --ascii_distro arch. Then, if you decide you like this change, simply replace the command “neofetch” with your new command in .bashrc .